TULARE, Calif. — Texas native Aaron Reutzel scored his first World of Outlaws Craftsman Sprint Car Series victory in thrilling fashion Friday night at Thunderbowl Raceway, after exchanging multiple slide jobs with local favorite Cory Eliason. A lap 20 yellow flag for leader Sheldon Haudenschild bunched the field together and allowed Reutzel to begin picking off the leaders, finally completing his run to the front with five laps remaining. Behind the winner, Eliason settled for second and Donny Schatz completed the podium in third. Eliason, aboard the famed Roth Motorsports No.83, won the Craftsman Club Dash to earn the pole for the 35-lap feature, starting alongside fellow California native Jason Meyers. In search of his first Outlaw victory, Eliason set the pace for the first 11 laps before giving way to Haudenschild on the 12th circuit. Haudenschild, who set a Tulare track record in qualifying, seemingly had the fastest car on the track and maneuvered the lapped traffic well as he continued to extend his lead. But coming off of turn four on lap 18, Haudenschild got into the back of a lapped car and the Stenhouse Jr.-Marshall No. 17 never settled down. Haudenschild muscled his ill-handling machine through turn one and two before making heavy contact with the frontstretch wall at the completion of the lap, ending the young gun’s bid for his third win of the young season. Eliason assumed the lead, but this time with nine-time series champion Schatz alongside of him. The Visalia, California native got a strong restart and established a sizeable lead over the veteran. 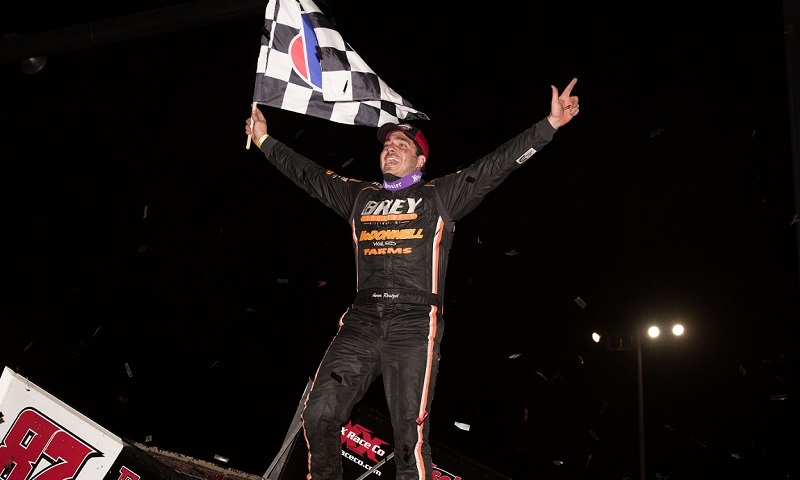 Meanwhile Reutzel, who restarted sixth, came to life as he pounded the cushion, weaving in and out of cars grabbing third on lap 23 and passing Schatz two circuits later to claim the second spot. Reutzel arrived at leader Eliason on lap 28 and the duo waged war for the top spot, as you would expect of two drivers looking for their first World of Outlaws victory. The duo exchanged sliders in each corner, exciting the large Thunderbowl Raceway crowd. Reutzel secured the victory on lap 31 as he powered his Baughman/Reutzel owned No. 87 around Eliason down the backstretch, pulling away for his first career Outlaw triumph. Eliason settled for second and was in good spirits after the race. Schatz was also pleased with his podium finish as he extended his early series points lead. Dominic Scelzi and 12th-starting Carson Macedo completed the top five. Tim Kaeding, aboard the Sides Motorsports No. 7S, earned KSE Hard Charger honors after coming from 16th to finish eighth in his first start for Sides. A-Feature (35 laps): 1. 87-Aaron Reutzel [$10,000]; 2. 83-Cory Eliason [$5,000]; 3. 15-Donny Schatz [$3,000]; 4. 41S-Dominic Scelzi [$2,700]; 5. 21X-Carson Macedo [$2,500]; 6. 9-Daryn Pittman [$2,200]; 7. 49-Brad Sweet [$2,000]; 8. 7S-Tim Kaeding [$1,800]; 9. 14-Jason Meyers [$1,600]; 10. 24-Rico Abreu [$1,450]; 11. 57-Giovanni Scelzi [$1,300]; 12. 18-Ian Madsen [$1,200]; 13. 45-Paul McMahan [$1,100]; 14. 29-Willie Croft [$1,000]; 15. 4-Parker Price-Miller [$950]; 16. 2-Shane Stewart [$900]; 17. 41-Jason Johnson [$850]; 18. 21-Brian Brown [$750]; 19. 5-David Gravel [$725]; 20. 26-Joey Saldana [$]; 21. OO-Dane Lorenc [$]; 22. 1S-Logan Schuchart [$]; 23. 17-Sheldon Haudenschild [$700]; 24. 49X-Tim Shaffer [$700]; 25. 88N-DJ Netto [$700]; 26. 13-Clyde Knipp [$]; 27. 83JR-Kyle Hirst [$700]; 28. 1A-Jacob Allen [$700].